Creating a healthy workspace doesn't require dismantling your entire office or spending thousands of dollars. The air rise pro from stand up desk store is an affordable and high-quality way to change any existing surface into a standing workstation. 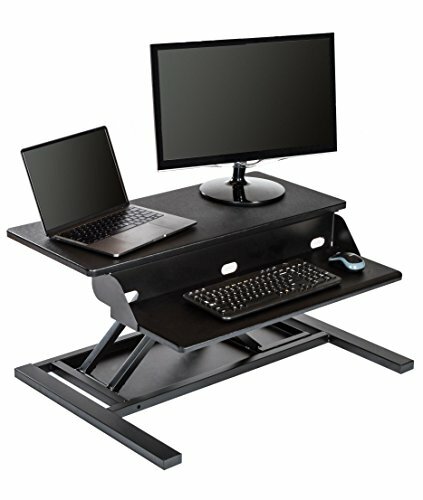 This adjustable height desk easily raises and lowers in mere seconds, helping you strike a balance between sitting and standing. Designed with two tiers for ideal ergonomics, the spacious top shelf holds a variety of monitor setups and the lower shelf houses your keyboard and mouse. A pneumatic air cylinder enables smooth adjustment from top to bottom, giving you the flexibility to move from sit to stand. The 32" wide desktop gives you room for dual monitors, while a spacious lower tier holds your keyboard and mouse. Even when raised to its maximum 15.75 inches above your desk, the air rise pro remains stable and reliable with a well-weighted steel frame, holding up to 50 lbs. Sturdy & smooth movement: The sturdy desktop is optimized to smoothly raise and lower 15 lbs.